Join us for several webinars in the coming months! 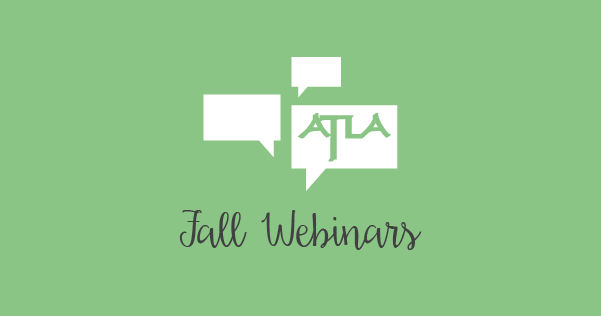 These webinars are hosted by ATLA and our partners as a way to foster the exchange of ideas within the theological librarianship profession and share information about important resources. As you know, your users’ information needs don’t end at the library door or during hours that the library is unavailable. QuestionPoint provides a complete virtual reference management system, integrating chat, e-mail, a reference knowledge base, reports and analytic tools to give you a complete view of reference activity. Expand your hours of service to offer live help anytime through membership in the 24/7 Reference® Cooperative. Question Point allows you to support students and faculty around the clock! During this session, you also will learn about a new ATLA incentive program just for ATLA members. Why should we be Innovative? A Culture of Innovation or Innovation of Culture? We welcome questions from participants. Please contact us at memberrep@atla.com if there are any topics you would like to add to the agenda in advance of the meeting. There will be plenty of time for current participants to share their experiences, including providing feedback from patrons and examples of how you’ve created awareness of the program at your library.